Visegrád Group poses more of a threat to the EU than Brexit…… – The Tundra Tabloids……. Neither Brussels nor the rest of the EU want to hear about Britain’s internal squabbles any longer that is because the EU is steeling itself for a much greater conflict than a mere cross-Channel tiff.Battle plans are being drawn up for the great confrontation. On one side is the Brussels old guard, cheered by the fact that German Chancellor Angela Merkel has finally managed to cobble together a coalition government. 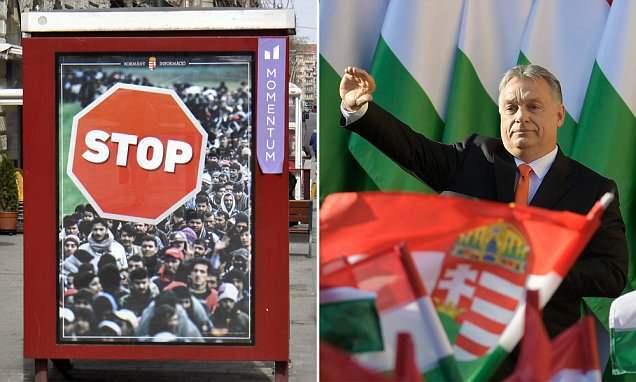 On the other side, however, is the new existential threat to the Brussels elite, the self-styled ‘bad boys’ of Europe, including Hungary, whose avowedly anti-immigration Prime Minister Viktor Orban ([pictured) is set to win another landslide election victory, as well as Czech Republic and Slovakia. He has endorsed weekend, billboards and newspaper advertisements with queues of non-white migrants and a big red badge saying ‘STOP’. Previous Post Previous Post Tire inferno: Seven Islamonazi ‘Paleostinians’ killed as the IDF defends its border……. Next Post Next Post Claim: Queen Elizabeth is related to the warlord of the desert, Mohamed…….